Photos of the Day: “Road to Greeley” and the artiste! My little boy has autism. He is fascinated by power poles and curves in roads. Driving to Greeley is a treat, because of the curves and power poles – I’d never notice these if it weren’t for him! 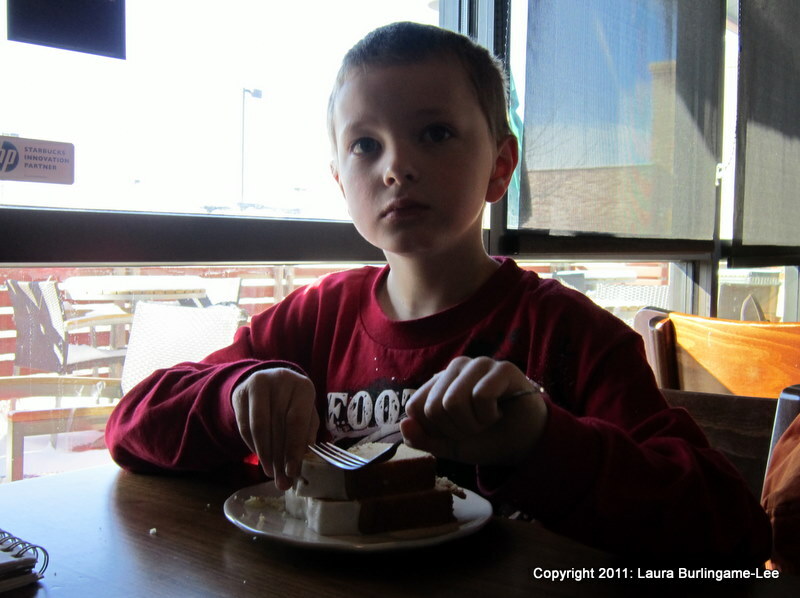 Potty and Autism and ODD…oh my. If anyone had told me 6 years ago that I’d still be changing diapers on a nearly 6-year old, I have to admit I would have been scared spitless and wondering what the hades I’d gotten myself into. And yet, here we are with Aidan in kindergarten and still wearing pull-ups because he either can’t or won’t use the toilet. I remember when he was 3 and 4, people would say to me, “Don’t worry. He won’t go to school in diapers.” Well…again, here we are. Now, I’m just hoping he won’t go to high school in pullups. The thing with Aidan is that, in terms of the autism, he’s pretty high functioning. He talks, expresses emotion, interacts socially (to some extent), and is generally a sweet little kid. Here’s where the other side, the ODD, comes in though. ODD is short for Oppositional Defiant Disorder, and it roughly boils down to where a child will say no and be oppositional simply for the sake of being oppostional. If you say the sky is blue, this child will say it’s purple with yellow polka-dots until he’s screaming bloody murder and insisting it’s purple with yellow polka-dots. This all occurs without me arguing with him. With some things, like the color of the sky, it’s really no big deal. But, with some things, it IS a big deal – like with potty training. When I said “can’t or won’t” I was referring to the ODD. Aidan CAN use the potty to urinate, and generally does except when he’s in an ornery mood. Then, he’ll go in his pullup purposefully if I ask him to use the potty. Using the potty is a battle, no matter what I try, because of the autism-ODD combination. Now let me explain that I have a Ph.D. in counseling psychology. I KNOW what to do, and we have a very behavioral household. There are rewards for trying, and better rewards for doing. For oppositional behavior, there are set consequences – losing privileges and time-outs along with losing whatever activity he was engaging in during the oppositional period. (Losing it for a time period, not permanently depending on what it is – I don’t want to punish my daughter for her brother’s behavior.) The long and short of it is that I know what to do – and it’s *still* frustrating. ODD is a frustrating disorder to say the least. Sometimes he’ll just say no and/or refuse to do something for reasons I can’t begin to understand. Sometimes, it’s even for things he enjoys and wants to do. I don’t think even HE understands it sometimes. Stubborn is an understatement – this kid sometimes gets in his own way. Adding the autism into the mix complicates things because he has trouble relating to people anyway. I’ve been asked how much is ODD and how much is autism, and I honestly don’t know except to say I’ve seen both. ODD doesn’t account for his fascination with automatic doors, elevators, transformers (the ones on the power poles, not the toys), and lights or his language and physical delays. Autism doesn’t account for the oppositional behavior and the purposeful defiance that I see. In the end, I think it burns us both out. I see him get so frustrated and upset and I WANT to help him. My love for this child, in spite of the ODD, is unending and I wish I could do more to help make things a little easier for him. And yet, I get burned out and frustrated. When I’ve changed the disgusting, feces-laden pullup for the 8th or 9th time in a day, there are times when I just want to scream. When I have to deal with “no” and “I won’t” and “You can’t tell me what to do” or him ignoring requests repeatedly, I want to run away. I get angry, frustrated and exhausted. So where do I go from here? I keep loving this special child that tests my patience every day. I enjoy and appreciate the smiles and the happiness that I’m so lucky to have, given his autism. I love the hugs and imagination, and even the lights, elevators, escalators, and “button doors.” I see things I wouldn’t ordinarily pay attention to, like the color and shape of the transformers on the power poles and the shape of the lights and buttons in elevators. And, I keep trying. And trying. And trying, and trying. I have faith that he can eventually do this, and that I will survive it. And I never, never, ever give up. I know most people in my field say that you don’t really remember things until you’re much older than I was in this picture. But I say they’re wrong. I remember this picture being taken, not in the way we typically remember things, but in a more tactile, textural way. My memories from this age are all sensory – tactile, specifically. I remember the color and feel of the mesh screen that covered the fireplace (I’ve checked this out with my mom – she doesn’t know how I’d remember that!). On the day in question, I remember the rough, warm feeling of the rock planter that was on the side of the house…the texture was rough, and the rockes were like sandstone. I remember the feel of the breeze, and that the rocks were warm to the touch, and the smell of the daffodil. I remember feeling lifted and then set down into the grass (don’t ask me who did it – I don’t remember that! )…the point of all this reminiscing is that I do remember some things from that time period, all of them sensory. One other thing I remember is a deep sense of contentment. The adult Laura would say that I trusted the world around me, and myself and felt my place in the world. This sense would become shaken to its core in the next few years, and would continue on throughout much of my life. Living with a depressed mother, an alcoholic father, and then having two sisters added to my life was a lot for this little person to handle, and the next thing I remember is spending a lot of time crying. Interestingly enough, my first clear memory of my mother is of her standing in front of the windows in the living room and crying – because my dad had stayed out drinking all night again and she didn’t know when or if he’d be home. There was a lot of sadness in my family. Through some pretty dysfunctional family dynamics, I learned that my needs came last, and that I was selfish to even consider myself before everyone else. I had the “selfish” label thrown at me more times than I care to remember, as I’m sure many other little girls have…and I learned quickly that if I trusted my gut feeling on what was right or wrong, I’d end up hurt. Abusive family dynamics work that way – you learn that what the abusers say is truth IS truth if you want to remain intact. In my family, the abuse was mainly psychological and emotional…but it still left its scars, scars I am still dealing with today. The trust I had in myself was worn away by day after day of denying my own valid needs in favor of catering to others’ – this is what you do to survive. I’ve struggled with the effects of this pattern for decades now. I really struggle with needing to please people and feeling like I need their approval. I struggle with developing and maintaining healthy boundaries, and I struggle with being myself AND being in healthy relationships. I’ve dealt with anxiety and depression. That’s a lot of baggage – and I’m proud to say I’m making progress. I am not the same person I was even two years ago – and I like myself a lot more now. I’m lucky enough to be able to share this process with others, and to help them on their journeys as well. These days, I’m trying to get back to the little girl in the picture – back to the days when I felt content in myself, trusted the world around me, and trusted myself. It’s hard work, too. There are things I can trust, though – I can trust that the spring warmth on frozen ground will bring flowers and sweet smelling grass. I can trust that the daffodils will still bloom every year. I can trust that my little girl will have the chance to trust herself, and recognize that her needs and wants are valid (even if she doesn’t get everything she wants!) I can trust myself that, as a mother, my daughter and my sons will be raised differently and in a world where their needs are honored and their selves are valued. I can trust that I won’t always be perfect, but that the love I have for my children is enough, and that if I honor them as unique, amazing little people, my love will shine through and guide them on their ways. And finally, I can trust that if I learn to trust myself, I can be a good example for them, in their journeys. Ok – I worked my tail end off yesterday – syllabus for the class I’ll be teaching this fall (Developmental Psychology), Designing my business cards and brochures, meeting with people about office space…it was a busy, busy day. So, I’m taking a break today. When I work with clients, I’m always encouraging people to be gentle with themselves. That doesn’t mean not being accountable for your actions, by the way – it does mean if you have to take yourself to task you can do it in a way that’s kind and gentle. One of my friends recently about how the Golden Rule also means treating yourself the way you’d want to be treated. If you’ll notice, the Golden Rule doesn’t say, “Treat others as you treat yourself,” but rather “as you’d want to be treated.” So, why do we have so much trouble treating OURSELVES the way we’d want to be treated? How often do we find ourselves chronically putting our needs last? Or ignoring our bodies’ needs for rest and relaxation? How often do we take care of everyone else, leaving no time to do so for ourselves? For women, especially, it’s a chronic issue. When I work with people who chronically ignore or negate their own needs I used what I call “Healthy Selfishness.” I use this temr for a couple of reasons. One is that “selfishness” has been a label thrown at us likely since we were children, and it has such a negative connotation that reclaiming the word in a different way helps people see that it’s NOT a bad thing to take care of themselves. That’s the “Healthy” piece. It’s healthy to care for ourselves, and to let ourselves enjoy life and things we enjoy. So, today I’m going to play. I’m getting out my kid’s easel, and we’re going to paint on the porch with bright tempera paint and great, big, chunky kids’ brushes. We’re going to splash in the wading pool, and we may go to the library as well. The point is, I’m going to let me kids teach me to play again. Somewhere along the way to being a “responsible adult,” I lost that. I was always the “responsible child” so losing play happened pretty early for me. Today, I find myself yearning to let go, to play, to let loose – and I don’t know how. So…I’m going to the best teachers I know – my children. I do have things I “should” do – I should work more on the development psychology class, I should work more on the paperwork for my private practice…but I also should relax, take care of myself and treat myself the way I’d want to be treated. I should also not judge myself as harshly and punitively as I do. I should treat myself gently, respectfully, and lovingly. And that means paying attention to my need to relax, play, and cut loose a little. 2) Shake well and serve does NOT work in cars! 5) New crevices are invented the longer you’re on the road. 6) When the kids say, “Are we there yet?” and you haven’t even left the driveway, you know it’s going to be a long day. 9) Do NOT allow noise-making toys to come in the car with you. You will lose your sanity within 2 1/2 minutes. 10) Sugar is NOT your friend. 11) Never take toddlers on long trips until they’re completely potty-trained. 12) Even when you leave space for more crap, the crap you get STILL ends up taking more space than you have. 13) When the water coming out of the hotel faucet is brown…worry. Worry a lot. 14) Little kids tag team to annoy, and the sum of the volume of their voices is greater than each one could possibly be alone. 15) Tinkerbell is NOT cute after the DVD has been played over 20 times. In one trip. 17) Schedules are made to be broken. 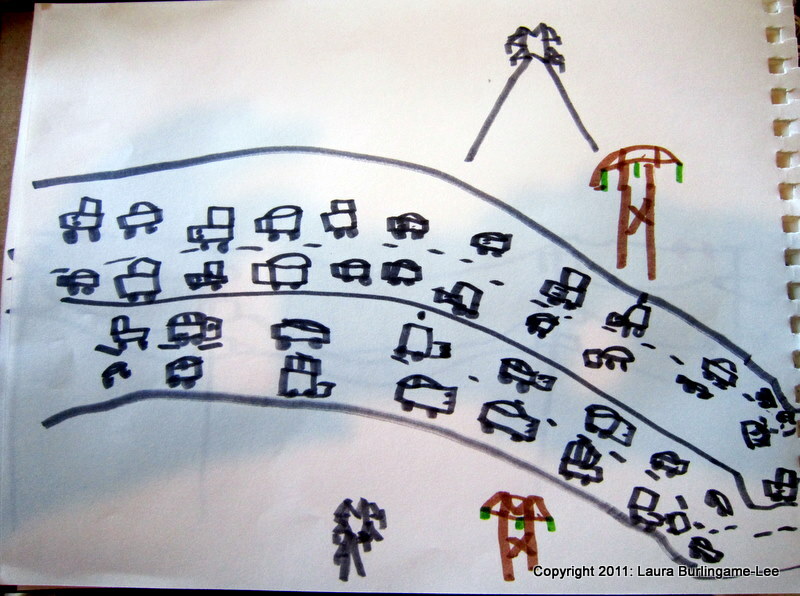 18) Construction delays always occur when your kids are at their crabbiest. 19) The food you ate that morning will inevitably visit again by noon. 20) You will always be one diaper short. Always. 21) Family is…family. ‘Nuff said. 22) Kids always have to go to the bathroom immediately AFTER you pass the rest stop. 23) There is always another souvenir. 24) When going uphill, you’re always behind the truck. 25) You’ll never have enough time or money while on vacation – and they both go too fast. Any more you all want to add? Let’s see what we can come up with? Something really cool happened this week – Aidan lost his first tooth. I know I wrote about that earlier, but what’s amazing to me, and where I learn so much from this child comes from what he did later. Now you all know that the tooth fairy is a pretty cool gal, right? Leave your old, fallen-out tooth under the pillow and she gives you MONEY for it – sounds like a golden exchange in MY book! And inflation has affected the exchange rate since when I was a kid…I used to get a dime. Kids nowadays get more. I’ve heard of as much as five dollars…but in our world, the tooth fairy is an activist that shares a little with each kid so (ideally anyway) every kid gets something. So, in our bleeding-heart liberal, activist house the tooth fairy gives the kids a dollar. Now some kids would be saying, “ONLY a dollar? C’mon, Mom…you can’t buy anything with just a DOLLAR!” Aidan with his autism really doesn’t have any real idea about what quantity means with money, just that money means you can buy things. And Aidan didn’t want the tooth fairy to leave paper money – no, he wanted COINS. Aidan likes coins…they’re shiny, you can line them up, you can count them, stack them, roll them…they’re a lot more fun than a piece of paper you can’t even color on. Aidan also knows that you can buy things with coins and “cards” ( or “plastic fantastic” as one tour guide I ran into called them.) Paper money really doesn’t mean much to him – coins are more substantial and have a lot more meaning. For days after the Tooth Fairy came, Aidan held onto his coins with a vengeance. NOBODY was going to touch his coins. He either carried them in his little fist, or had them neatly lined up on the kitchen counter. Yesterday (Saturday) he wanted to take them to church. Now I run our church nursery during all the services on Saturday night and Sunday morning. Aidan is friends with one of the pastor’s little boys, and I assumed he wanted to show Gabe his coins. Gabe wasn’t there that night – in fact, there was no one in the nursery so we went to sit and enjoy the service. Becca doesn’t do too well during these, but Aidan loves to go. He’ll listen and try to say the prayers, sing the hymns and generally do what everyone else is doing. It’s not just imitation, though – Aidan seems to genuinely “get” church and spirituality. I learn a LOT from this little guy. Wow. How many of us, thinking about everything else we can do with money, think of God last? And here is this little 5 1/2 year old boy, who knows he can buy things with coins, giving literally every bit to God. I like to think of myself as a giving person, but that day, in that room, I saw how little I actually do give. This little person, who gave everything he had, has given far more than I ever will. Most importantly, he gave to me – the lesson of giving, and of God. Happy Father’s Day to all of you who love your children…the single mothers taking on both roles, the new fathers, and the fathers with children who are growing up…the fathers of grown children and the grandfathers…the men who are fathers in every way except for biology, the men who realize that “fathering” is a verb that goes WAY beyond conception, and most of all, our Father and Creator.